It is not difficult to avoid parking citations. Read and follow these simple rules — they will save you money! Do not park on campus in a space reserved for a permitted vehicle. The university has 12 parking garages that are open for public use on a paid basis. They are located around the perimeter of campus. See the garage page for their location. There are pay and display meters throughout campus that may be used for short-term parking. Carefully read the signs that apply to the parking space you are in from the top down. All spaces on campus require a permit. If there is no sign in front of a space, refer to either the sign at the entrance of the parking lot or the nearest posted sign that governs the area. Do not park in spaces marked "At All Times." Parking is enforced 24 hours a day and citations are issued to improperly parked vehicles. Other special restrictions include "A," or "F" required after 4 p.m.
Do not park in spaces designated for persons with disabilities unless you have the proper permit and state-issued ADA placard or license plate. The university strongly supports the ADA and stiff fines are issued to cars parked illegally in these spaces. Note: Spaces designated for persons with disabilities are so designated at all times. From 7:30 a.m. until 5:45 p.m., a State of Texas disability placard/license plate and valid university permit are required. After 5:45 p.m., a State of Texas disability placard/license plate is still required. Be sure to properly display your permit. You will be issued a citation if the officer cannot see your permit. Instructions on how to display the permit are printed on the back. Permits are only valid in certain areas. Do not park in an area marked for another permit type. Most lots do not allow overnight parking. Please read the signs carefully to avoid citations. 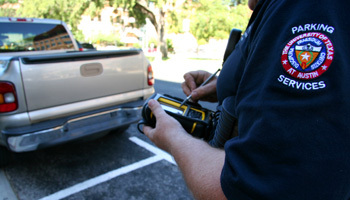 Any UT permitted vehicle may park in a Loading Zone (LZ) for 30 minutes with its emergency flashers on to load/unload.